Read the letter which was received by e-mail. a) Find some examples of Complex Object in the letter. b) What other political and family days do you celebrate during a year? c) Would you agree with the proposal of our American pen friend to declare a Friends Day on July 31st? Прочитайте письмо, которое было получено электронной почтой. a) Найдите некоторые примеры Complex Object в письме. b) Какие другие государственные и семейные праздники вы празднуете в течение года? c) Согласились бы вы с предложением нашего американского друга по переписке об объявлении День Друзей 31-го июля? a) We want them to, we would like you to, they give you, they do many things for, they expect nothing for, you will send them. b) We celebrate the 12th of November as a day of Independence. We also celebrate the 31st of December as a New Year day. 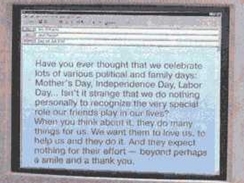 c) I think I’ll agree with the proposal of our American pen friend to declare a Friends Day on July 31st because I think many people celebrating this day will think about their friends and meet with them.